Wilton and Frances were enmerated in the Houston, Harris Co., TX 1940 Federal census. He was an assistant traffic manager age 32, she was 30. The only child in the household was Dollie Ann 9. [S336] Ancestry.com, Collin County Clerk's Office; McKinney, Texas; Collin County Marriage Records. Ancestry.com. Texas, Select County Marriage Records, 1837-2015 [database on-line]. Provo, UT, USA: Ancestry.com Operations, Inc., 2014. [S838] DC: Wilton Chappell Moore. [S807] Find A Grave, online http://www.findagrave.com, Find A Grave, database and images (https://www.findagrave.com : accessed 22 February 2018), memorial page for Wilton Chappelle Moore, Sr (29 Apr 1907–28 Jan 1952), Find A Grave Memorial no. 111651926, citing Restland Memorial Park, Dallas, Dallas County, Texas, USA ; Maintained by Julia Baker (contributor 46494619) . [S807] Find A Grave, online http://www.findagrave.com, memorial # 108859480. Served as a Veterinary Sergeant in the Spanish American War. He was with the Colorado Volunteers, where he was a Pharmacy student. Worked for the Houston Drug Company as a traveling salesman. At the time of his marriage to Zinn, his mother was living in DC. G. Harvey and Zintallie were enumerated in the 1920 Los Angeles, Los Angeles Co., CA, federal census ED 182, page 4A. He was a salesman age 42, she was 25. The only child in the household was Nan, 6 months. His mother Laura A, age 65, was also in the household. George H. and Zinn T. were enumerated in the 1930 Washington, District of Columbia, federal census, ED 291, page 1A. He was a druggist, age 47, she was 32. The only child in the household was Nan, age 10, born in California. George Harvey held a license as a druggist in Colorado in 1940, but was enumerated in the household of Zinn Tallie in the 1940 Houston, Harris Co., TX federal census. [S479] MC: Norton - Alsup. [S476] George Harvey Norton, DC: George Harvey Norton. 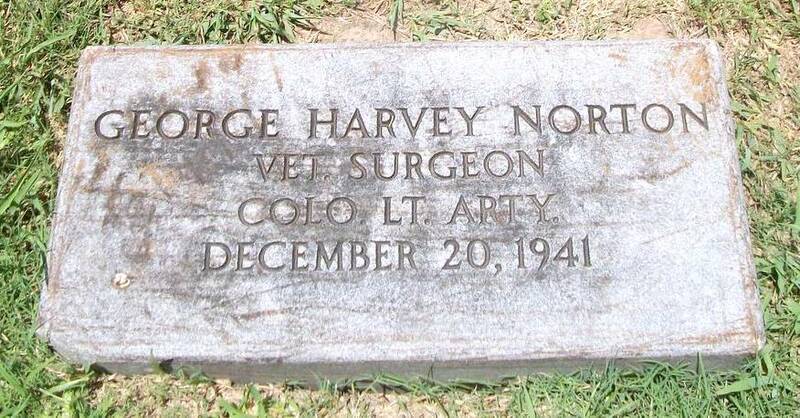 [S807] Find A Grave, online http://www.findagrave.com, Find A Grave, database and images (https://www.findagrave.com : accessed 22 February 2018), memorial page for George Harvey Norton (29 Jan 1869–20 Dec 1941), Find A Grave Memorial no. 116549150, citing Hollywood Cemetery, Houston, Harris County, Texas, USA ; Maintained by Susann (contributor 46849151) . The State of Texas has two different delayed birth certificates on file. The earliest one filed shows a birth date of 10 Oct 1891; the second 10 Oct 1890. The Social Security Administration accepted the 1890 date. Sissy was the younger of the two sisters by two years but their birth dates as accepted by the Social Security Administration would show Sissy as the oldest. Someone must have been fudging their age. She was listed in the 1920 census as 25; by 1930 she had gotten younger again, 32. Died at the Four Seasons Nursing Home in Austin, Dr. Welch attending. She had been admitted on 8-7-1970. SSAN 449-30-8536. The death certificate from the Texas Department of Health states that she died of Carcinoma of Breast metastatic to liver. She was buried in the Belton Cemetery by Morris Holmann of the Hyltin-Manor Funeral Home of Austin, Lot 285 (Alsup lot), 404 N. Main. She studied at Chicago University. [S182] Social Security Death Index (on-line), Ancestry.com, SSDI, Ancestry.com, SSAN 449-30-8536. [S477] Zinn Tallie (Alsup) Norton, Birth Certificate 509070 (22 June 1942). [S475] Zinn Tallie (Alsup) Norton, DC: Zinn Tallie Alsup. [S24] Charles Allen Converse, Some of the Ancestors and Descendants of Samuel Converse, Jr., of Thompson Parish, Kiliingly, Conn., Page 332. [S336] Ancestry.com, Town and City Clerks of Massachusetts. Massachusetts Vital and Town Records. Provo, UT: Holbrook Research Institute (Jay and Delene Holbrook). [S865] Ckara F. Johnson, DC: Clara F. Johnson. [S807] Find A Grave, online http://www.findagrave.com, Find A Grave, database and images (https://www.findagrave.com : accessed 18 October 2018), memorial page for Clara Holcombe Johnson (1849–1934), Find A Grave Memorial no. 38822507, citing Mount Hope Cemetery, Southern Pines, Moore County, North Carolina, USA ; Maintained by gleebigg (contributor 47112850) . Enter the cemetery from Morgantown Rd. The second driveway on the left is Section A; halfway donw on the right. [S102] Kate Holcombe Johnson, DC: Kate Holcombe Johnson. After their father's death, the family moved to Southern Pines, in 1894, to a farm located on what is now Youngs Road. Kate attended Wheaton College in Norton, Mass. and Mt. Holyoke College, where she graduated in 1912. She taught in a small mountain school near Tryon, NC, for a year prior to her marriage to Talbot, who was an attorney in Aberdeen. The Johnson home in Aberdeen was always open to friends from all over and after their children left for preparatory schools, Kate became deeply involved in civic and charitable work; in Bethesda Presbyterian Church, the Aberdeen Schools and PTA, Mt. Holyoke College Alumnae Circles, the Aberrdeen Library, Moore Memorial Hospital Auxiliary, Planned Parenthood, the local Welfare Program, American Red Cross, Book Clubs, Garden and Social Clubs and the Alfred Moore Chapter of the DAR. Following is a quotation from a special "This is Your Life" presentation at a meeting of the Alfred Moore Chapter, DAR written November 24, 1970 by the Johnsons' daughter, Betsy Jean Allport, edited by their son, Lawrence McNeill Johnson: "Now 82 years are passed in Kate Johnson's active life, and her hallmark has been made in the lives of the host of friends and loved ones that, if stretched out, would lengthen far out in space and time. She has had an enviable life's record and possesses a personality that has made this community a richer and better place because she has cared as she walked its paths, and more important, she cares as she walks today, slower to be sure, but still with a firmly resolved tread and a devotion to things that are worthwhile." She died on a Monday morning at home in Aberdeen following a short illness. Funeral Services were held Wednesday at 11 am at Bethesda Presbyterian Church with the pastor, the Rev. W.C. Neill, officiating. Interment followed at Old Bethesda Cemetery. James T. and Kate H. were enumerated in the 1920 Aberdeen Town, Sand Hill Township, Moore Co., NC, federal census. He was a civil attorney age 31, she was 31. 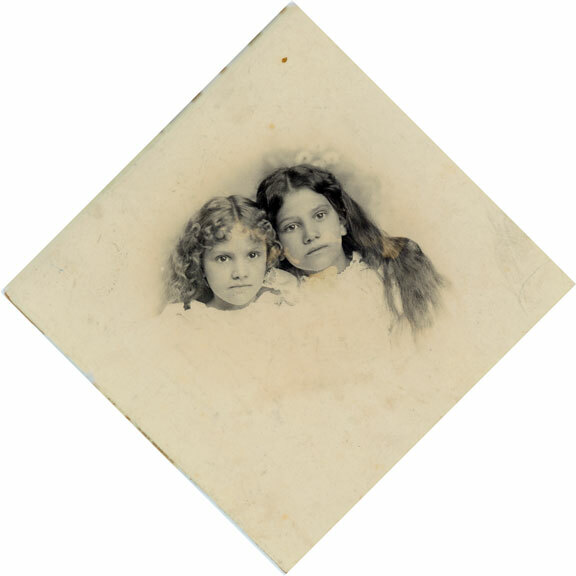 Children in the household were Miriam C. 5, and Betsy J. 1 year 10 months. They were enumerated next door to his parents. [S807] Find A Grave, online http://www.findagrave.com, Find A Grave, database and images (https://www.findagrave.com : accessed 18 October 2018), memorial page for Kate Holcombe Johnson (22 Nov 1888–5 Feb 1973), Find A Grave Memorial no. 35415294, citing Bethesda Cemetery, Aberdeen, Moore County, North Carolina, USA ; Maintained by gleebigg (contributor 47112850) . [S224] Records of the First Congregational Church, Photocopies unknown repository. [S161] Carol A. Laun, Granby Center Cemetery, Page 103/Item IV-67. [S807] Find A Grave, online http://www.findagrave.com, Find A Grave, database and images (https://www.findagrave.com : accessed 07 March 2019), memorial page for Julia A. Holcomb (17 Aug 1822–17 Mar 1881), Find A Grave Memorial no. 66030295, citing Granby Cemetery, Granby, Hartford County, Connecticut, USA ; Maintained by M Cooley (contributor 47154454) . [S807] Find A Grave, online http://www.findagrave.com, Find A Grave, database and images (https://www.findagrave.com : accessed 06 February 2018), memorial page for James Talbot Johnson (25 Sep 1888–9 Apr 1971), Find A Grave Memorial no. 35415269, citing Bethesda Cemetery, Aberdeen, Moore County, North Carolina, USA ; Maintained by gleebigg (contributor 47112850) . James' gravestone indicates that he was age 71 at death. As a farmer, James and his family would have suffered severely in 1816, "the year there was no summer," with temperatures in the 30's and snow in June. Crop failures were widespread and newly shorn sheep died in the cold. Many of his friends and family probably left Granby and settled in the Midwest. [S23] Jesse Seaver, The Holcomb(e) Genealogy, page 56, Item 218.2. [S25] Hannah McPherson, Holcombe Genealogy, Page 162/Item A-8-1-6-3-5. [S65] Deanna Holcomb Bowman Thomas Holcomb, Vol. I:Pg 157/Item 81635. [S25] Hannah McPherson, Holcombe Genealogy, page 161.2. [S862] Carol A. Laun, Burials in the Granby Center Cemetery, page 122, item O-66. [S336] Ancestry.com, Ancestry.com. Connecticut, Church Record Abstracts, 1630-1920 [database on-line]. Provo, UT, USA: 2013. [S25] Hannah McPherson, Holcombe Genealogy, page 162.2, item A-8-1-6-3-5. [S336] Ancestry.com, Connecticut State Library (Hartford, Connecticut); Probate Place: Hartford, Connecticut. Ancestry.com. Connecticut, Wills and Probate Records, 1609-1999 [database on-line]. Provo, UT, USA: Ancestry.com Operations, Inc., 2015. [S231] Granby Cemetery Inscriptions unknown repository. 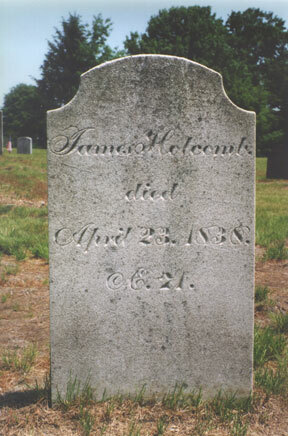 [S807] Find A Grave, online http://www.findagrave.com, Find A Grave, database and images (https://www.findagrave.com : accessed 18 November 2018), memorial page for James Holcomb (25 Sep 1767–23 Apr 1838), Find A Grave Memorial no. 66030161, citing Granby Cemetery, Granby, Hartford County, Connecticut, USA ; Maintained by M Cooley (contributor 47154454) . [S311] Unknown compiler, "Connecticut Deaths and Burials, 1772-1934," database, FamilySearch (https://familysearch.org/ark:/61903/1:1:F78K-368 : 9 February 2018), James Holcomb, 23 Apr 1838; citing Granby 113, reference 1 p2; FHL microfilm 3,141. [S336] Ancestry.com, Connecticut, Church Record Abstracts, 1630-1920 [database on-line]. Provo, UT, USA: 2013. [S807] Find A Grave, online http://www.findagrave.com, Find A Grave, database and images (https://www.findagrave.com : accessed 17 November 2018), memorial page for Miriam H. Coult Jones (1789–26 Jan 1870), Find A Grave Memorial no. 64665921, citing Granby Cemetery, Granby, Hartford County, Connecticut, USA ; Maintained by M Cooley (contributor 47154454) . [S25] Hannah McPherson, Holcombe Genealogy, Page 162.2/Item A-8-1-6-3-5-1. [S25] Hannah McPherson, Holcombe Genealogy, Page 163.1/Item A-8-1-6-3-5-2. James would have moved to Ohio between the birth of son Edward in 1841 and the birth of son Charles in 1844. James H. and Mary were enumerated in the 1850 Canfield, Mahoning Co., OH, federal census. He was a merchant, age 41, born in CT; she was 41, born in MA. Children in the household were James F. 13, Edward P. 8, and Charles H. 5. The census indicates that James and Edward were born in CT and that Charles was born in OH. Jas. and Mary F. were enumerated in the 1860 Johnston, Trumbull Co., OH, federal census. He was a farmer, age 51, she was 51. Children in the household were Edward P. 19, and Chas. H. 15. Mary and son Edward were enumerated in the 1870 Johnston, Trumbull Co., OH, federal census. She was 66, he was 27. [S25] Hannah McPherson, Holcombe Genealogy, Page 163.1/ Item A-8-1-6-3-5-3. [S807] Find A Grave, online http://www.findagrave.com, Find A Grave, database and images (https://www.findagrave.com : accessed 08 March 2019), memorial page for Mary Foote Holcomb (10 Aug 1809–15 Apr 1882), Find A Grave Memorial no. 34028243, citing Southwick Cemetery, Southwick, Hampden County, Massachusetts, USA ; Maintained by Kari Olson (contributor 47416912) . Phelps and Emily were enumerated in the 1850 Hartland, Hartford Co., CT, federal census. He was a farmer age 39, she was 38. Children in the household were Zeruah 15, Lydia 13, Jerusha 11, and Alma 6. Emily was enumerated in the 1880 Granby, Hartford Co. CT, federal census in the household of her half-brother, Amherst Holcomb. [S25] Hannah McPherson, Holcombe Genealogy, Page 163.1/Item A-8-1-6-3-5-4. [S235] Unknown subject unknown repository. Mary's tombstone indicates she was 46 at death, which would place her birth about 1773. [S227] Copied by C. G. Flanders, 15 October 1934 unknown repository. [S807] Find A Grave, online http://www.findagrave.com, Find A Grave, database and images (https://www.findagrave.com : accessed 07 March 2019), memorial page for Mary Holly Holcomb (1773–28 Mar 1819), Find A Grave Memorial no. 66030619, citing Granby Cemetery, Granby, Hartford County, Connecticut, USA ; Maintained by M Cooley (contributor 47154454) . Bowman mentions an earlier Ozias that died young. This Ozias is probably the Ozias serving in Captain Samuel Hayes Company in the Revolutionary War with his brother Benjah; and that is what McPherson says. He is listed in the Compiled Service Records of Soldiers who served in the Revolutionary War, Microfilm Publication M881, Roll 361. He was a Corporal in the 18 Regiment, Connecticut Militia, serving in New York from August 22, 1776 to September 26, 1776. When Ozias was born, the settlement of Salmon Brook, part of Simsbury, was a small group of perhaps forty houses composed of the families of the first settlers: Ozias' grandfather Nathaniel, George Hayes, James Hillyer, and others who all appear in one another's genealogies. But Salmon Brook was beginning to grow. Fears of the Indians had diminished so that the families of Simsbury that were looking for more land for their sons and daughters to call their own, began to migrate outward to swell the size of this community. In the 1740's Ozias was a growing up and assimilating the values of his parents, good Puritans, and feeling a growing sense of independence from the older community of Simsbury. The long weekly trips to Hopmeadow to worship were adding to the little society's desire for additional independence. Judah Holcombe purchased lots in the 1750's in the "Popatunuck" section of Granby, near Mountain and Lost Acres Roads. In 1762 Ozias acquired one of these lots facing Mountain Road. Ozias married and took the responsibilities of farming and raising a large family of his own. This apparently consumed most of his time as he does not appear in any elected or appointed positions in the town. Like others in the area, Ozias and Rachel began to clear their land and exploited the timber resources, not only to build their house, but also for sale. Ozias and this brothers, Silas and Benajah, all lived in the same vicinity and were full of energy and ambition, throwing up mile after mile of stone walls, clearing out fields and pastures, containing livestock, and marking boundaries. The 1790 Census of Granby showed 4 Males over 16, 2 Males under 16, and 2 Females. [S23] Jesse Seaver, The Holcomb(e) Genealogy, Page 56, Item 218. [S25] Hannah McPherson, Holcombe Genealogy, Page 161.2/Item A-8-1-6-3. [S65] Deanna Holcomb Bowman Thomas Holcomb, Vol. I:Pg 157. [S45] Albert C. Bates, Simsbury, Page 65. Other information on birth indicates 07 March 1736/37, (McCracken) or 6 March 1737 (McPherson). [S25] Hannah McPherson, Holcombe Genealogy, page 148.2, item A-8-1-6-3. [S862] Carol A. Laun, Burials in the Granby Center Cemetery, page 120, item O-22. [S807] Find A Grave, online http://www.findagrave.com, Find A Grave, database and images (https://www.findagrave.com : accessed 9 March 2019), memorial page for Ozias Holcomb (3 Mar 1736–7 Feb 1812), Find A Grave Memorial no. 55147295, citing Granby Cemetery, Granby, Hartford County, Connecticut, USA ; Maintained by Addie (contributor 47097158) . [S45] Albert C. Bates, Simsbury, Page 160. [S222] Unknown subject unknown repository. [S807] Find A Grave, online http://www.findagrave.com, Find A Grave, database and images (https://www.findagrave.com : accessed 9 April 2018), memorial page for Ozias Holcomb (3 Mar 1736–7 Feb 1812), Find A Grave Memorial no. 55147295, citing Granby Cemetery, Granby, Hartford County, Connecticut, USA ; Maintained by Addie (contributor 47097158) . [S120] Joseph E. Cornish, The History and Genealogy of the Cornish Families in America, Page 11. [S45] Albert C. Bates, Simsbury, Page 112. [S807] Find A Grave, online http://www.findagrave.com, Find A Grave, database and images (https://www.findagrave.com : accessed 21 December 2018), memorial page for Rachel Cornish Holcomb (3 Sep 1740–18 Oct 1799), Find A Grave Memorial no. 55147349, citing Granby Cemetery, Granby, Hartford County, Connecticut, USA ; Maintained by Addie (contributor 47097158) . [S232] Granby Cemetery Inscriptions unknown repository. McPherson names spouse as Susan, Bowman calls her Ruth. They moved to Champion, Jefferson Co., NY about 1800. The 1790 census of Granby shows Ozias Jr. with 1 Male over 16, 1 Male under 16, and 1 Female. Ozias was enumerated in the 1810 Champion, Jefferson Co., NY, federal census. There was 1 male over 45 and 1 female over 45. There were 3 males 16 thru 25 and 1 female 16 thru 25. [S65] Deanna Holcomb Bowman Thomas Holcomb, Vol. I:Pg. 157/Item 81631. [S807] Find A Grave, online http://www.findagrave.com, memorial # 167727364. Family information about Butler only mentions his wife, Mary L. (his second wife) and sons Daniel and William (his two youngest sons). Also says he bought 480 acres in Section 20 of Independence Township, which was to become the village of Clarkston. He built the fifth log cabin and the first saw mill in town using water power from the mill pond. [S25] Hannah McPherson, Holcombe Genealogy, Page 163.1/Item A-8-1-6-3-6. [S807] Find A Grave, online http://www.findagrave.com, Find A Grave, database and images (https://www.findagrave.com : accessed 18 April 2018), memorial page for Butler Holcomb (unknown–22 Jan 1847), Find A Grave Memorial no. 85220945, citing Lakeview Cemetery, Clarkston, Oakland County, Michigan, USA ; Maintained by JoanneS (contributor 47244215) . Rebecca Rector derived Allen's birth date from the date of death and exact age on his gravestone. Allen moved from Granby to Troy NY in 1812, and then later to Butternuts (now Morris) NY. Allen and Collata were enumerated in the 1850 Morris, Ostego Co., NY, federal census. He was a cabinet maker, age 68, she was 64. Children in the household were Collata 43, George 39, and Edgar 29. Edgar's wife Elizabeth age 24 and children Catherine E. 2, and Genevieve 2 months were also enumerated. Allen was again enumerated in the 1860 Morris, federal census. He was 78. Also enumerated in the household were Collaty 55, George 49, and Edgar 39. Edgar's wife Elizabeth 34 was also enumerated. Children listed but not identified were Catherine 12, G. 9, Eviline 6, Ferdinand 4, and Mary 1. [S25] Hannah McPherson, Holcombe Genealogy, Page 162.2/Item A-8-1-6-3-2. [S726] Rebecca Rector, "AA: Allen Holcomb." [S25] Hannah McPherson, Holcombe Genealogy, page 162.2. [S807] Find A Grave, online http://www.findagrave.com, Find A Grave, database and images (https://www.findagrave.com : accessed 18 April 2018), memorial page for Allen Holcomb (1782–23 Aug 1860), Find A Grave Memorial no. 128241324, citing Quaker Burying Ground, Morris, Otsego County, New York, USA ; Maintained by suscat (contributor 47662692) . Roswell Holcombe was born say 1771 at Salmon Brook, Simsbury (now Granby), Hartford Co., CT.1 He was the son of Ozias Holcombe and Rachel Cornish. Sterling moved from Granby to Brookfield, Madison Co., NY, and a few years later, to Pittsfield, Warren Co., PA.
Sterling and Lydia were enumerated in the 1850 Sugar Grove, Warren Co., PA, federal census. He was a farmer, age 74, she was 69. Children in the household were Rella 30, and Hiram 24. Sterling was enumerated in the 1860 Sugar Grove, Warren Co., PA, federal census in the household of Emiline C. Holcomb. She was 34. The next entry was for Harriet L. Holcombe 5, then Martha E. Holcombe 2, then Sterling 84, and last Hiram 34. [S25] Hannah McPherson, Holcombe Genealogy, Page 163.1/Item A-8-1-6-3-8. [S807] Find A Grave, online http://www.findagrave.com, Find A Grave, database and images (https://www.findagrave.com : accessed 18 April 2018), memorial page for Sterling Holcomb (unknown–14 May 1861), Find A Grave Memorial no. 15554715, citing Stilson Hill Cemetery, Sugar Grove, Warren County, Pennsylvania, USA ; Maintained by Roxann (contributor 46840771) . Nettie Holcombe was born say 1779 at Salmon Brook, Simsbury (now Granby), Hartford Co., CT.1 She was the daughter of Ozias Holcombe and Rachel Cornish. [S25] Hannah McPherson, Holcombe Genealogy, Page 163.1/Item A-8-1-6-3-7. [S807] Find A Grave, online http://www.findagrave.com, Find A Grave, database and images (https://www.findagrave.com : accessed 9 March 2019), memorial page for Rachel Holcomb Benjamin (1759–10 Nov 1804), Find A Grave Memorial no. 64167922, citing Granby Cemetery, Granby, Hartford County, Connecticut, USA ; Maintained by M Cooley (contributor 47154454) . 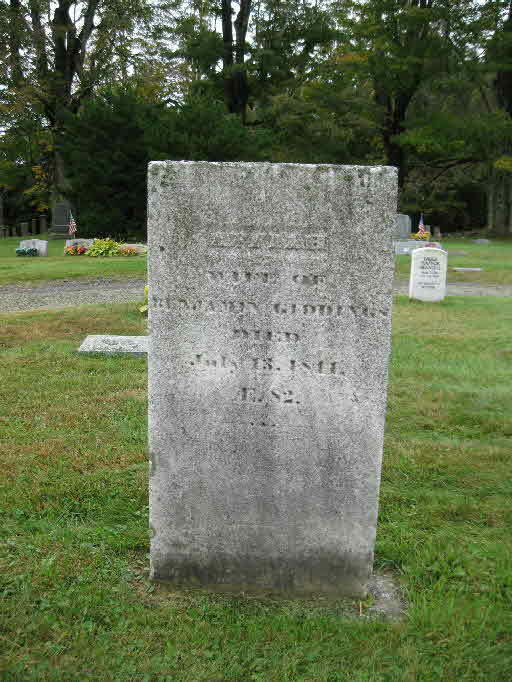 [S807] Find A Grave, online http://www.findagrave.com, Find A Grave, database and images (https://www.findagrave.com : accessed 18 April 2018), memorial page for Affiah Holcomb Giddings (1759–13 Jul 1841), Find A Grave Memorial no. 77431071, citing West Hartland Cemetery, Hartland, Hartford County, Connecticut, USA ; Maintained by Deirdre (contributor 48960828) . Children of Penelope Holcombe and Abner Bushnell Jr.
[S25] Hannah McPherson, Holcombe Genealogy, Page 163.1/Item A-8-1-6-3-10. [S807] Find A Grave, online http://www.findagrave.com, Find A Grave, database and images (https://www.findagrave.com : accessed 18 April 2018), memorial page for Penelope Holcomb Bushnell (1774–23 Dec 1811), Find A Grave Memorial no. 79089378, citing East Hartland Cemetery, Hartland, Hartford County, Connecticut, USA ; Maintained by ggramtoby (contributor 47311061) . Judah served as Justice of the Peace and Deputy of the Connecticut General Assembly and as such he is considered a Patriot by the DAR. His marker in the Granby Center Cemetery section 0-107 reads as follows: Memoriae Sacrum Judah Holecomb Esa. Daid January 5th AD 1802 Aged 97 years Death is a debt to Nature due which I have paid & So must you. McCracken notes that Bailey says he married (2) at Granby, 30 June 1774, Anna Hubbard; McCracken however, seems to accept Prudence Goodrich. ". . For many years sustained the office of Deacon in the Church, and Justice of the Peace. His surviving descendants are 9 children, 57 grandchildren, 129 great-grandchildren, and one great-great-grandchild." Judah's house, built about 1776, currently at 257 north Granby Road in Granby CT. It is on the National Register of Historic Places.The house remained in the Holcomb family until 1894. Judah is the Patriot for DAR members 286754, 212606, 290243, 838321, 522470, 791973, 542552, and 704276. [S23] Jesse Seaver, The Holcomb(e) Genealogy, Page 42, Item 206. [S65] Deanna Holcomb Bowman Thomas Holcomb, Vol. I:Pgs. 70-71/Item 816. [S94] Nathaniel Goodwin, Genealogical Notes, or Contributions to the Family History of Some of the First Settlers of Connecticut and Massachusetts, Page 78/Item 51. [S105] Barbara Anne Brandes, "NSDAR: 704276, Barbara B Barrera." [S25] Hannah McPherson, Holcombe Genealogy, Page 148.2/Item A-8-1-6. [S25] Hannah McPherson, Holcombe Genealogy, page 101.2, item A-8-1-6. [S859] Laura Lee Simmons, "NSDAR: 522470." [S45] Albert C. Bates, Simsbury, Page 126. [S25] Hannah McPherson, Holcombe Genealogy, Page 149.1. [S862] Carol A. Laun, Burials in the Granby Center Cemetery, page 124, item O-107. Simsbury Vital Records show death on the 11th, the Gravestone inscription says 13th, so apparently she died on the 11th and was buried on the 13th. [S161] Carol A. Laun, Granby Center Cemetery, Page 124/Item O-106. 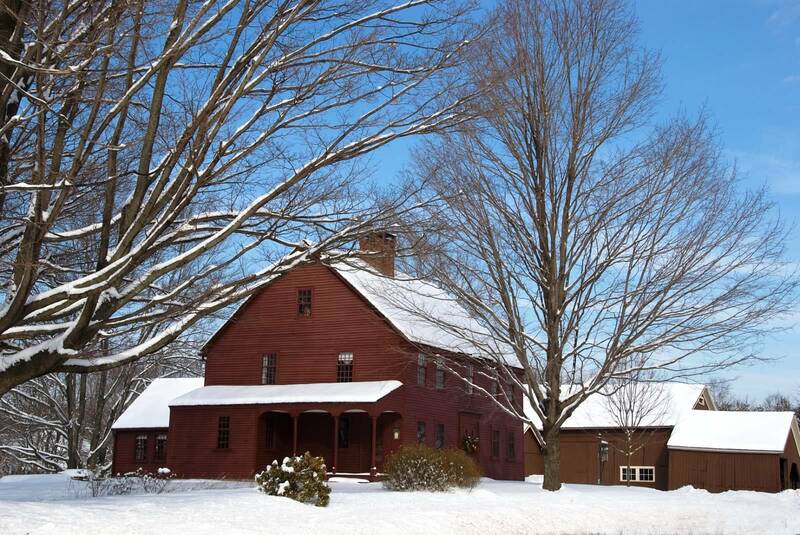 In 1753 Samuel built a large house at "Bushy Hill", two miles west of Salmon Brook in which he and his descendants lived nearly a century and which is still in good condition, now the residence of Starr Holcomb. Children of Rosanna Holcombe and Samuel Hayes Jr.
[S25] Hannah McPherson, Holcombe Genealogy, Page 149.1/Item A-8-1-6-1. [S45] Albert C. Bates, Simsbury, Page 65. [S807] Find A Grave, online http://www.findagrave.com, Find A Grave, database and images (https://www.findagrave.com : accessed 9 April 2018), memorial page for Rosanna Holcomb Hays (24 Jun 1732–8 Nov 1814), Find A Grave Memorial no. 66031447, citing Granby Cemetery, Granby, Hartford County, Connecticut, USA ; Maintained by M Cooley (contributor 47154454) . [S25] Hannah McPherson, Holcombe Genealogy, Page 149.1, item A-8-1-6-1. Silas served as a lieutenant in the 2nd Battalion under Col. Thaddeus Cook, 1776, Connecticut troops. [S23] Jesse Seaver, The Holcomb(e) Genealogy, Page 42, Item 206.2. [S65] Deanna Holcomb Bowman Thomas Holcomb, Vol. I:Pgs. 71, 157/Item 8162. [S25] Hannah McPherson, Holcombe Genealogy, Page 161.2/Item A-8-1-6-2. [S104] DAR DAR Lineage book, Vol. LXXV:Pg. 47/Item 74145; Vol. LXXVII:Pg. 332/Item 76884. 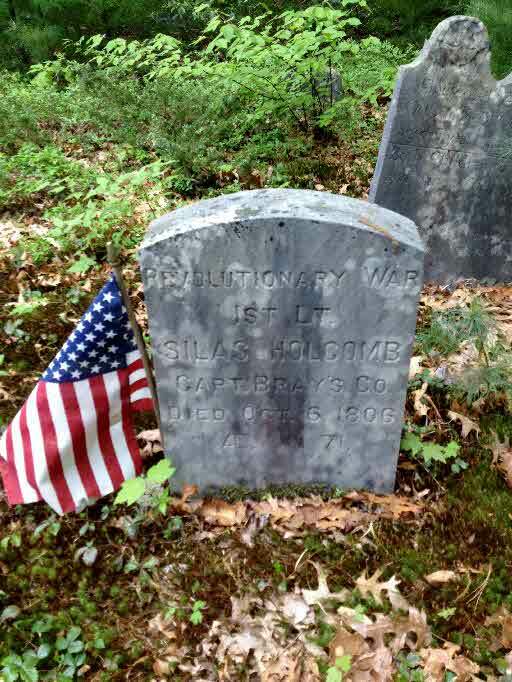 [S807] Find A Grave, online http://www.findagrave.com, Find A Grave, database and images (https://www.findagrave.com : accessed 08 April 2018), memorial page for Silas Holcomb (27 Nov 1734–6 Oct 1806), Find A Grave Memorial no. 63712780, citing Lee Cemetery, Granby, Hartford County, Connecticut, USA ; Maintained by M Cooley (contributor 47154454) . [S23] Jesse Seaver, The Holcomb(e) Genealogy, Page 43. [S63] C. W. Hayes, George Hayes of Windsor. [S65] Deanna Holcomb Bowman Thomas Holcomb, Vol. I:Pg. 157. [S25] Hannah McPherson, Holcombe Genealogy, page 163.2/Item A-8-1-6-4. [S45] Albert C. Bates, Simsbury, Page 176. [S161] Carol A. Laun, Granby Center Cemetery, Page 124. 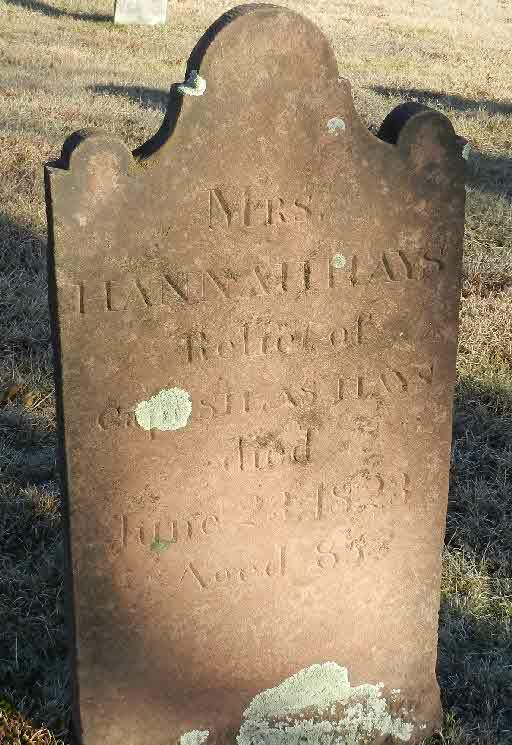 [S807] Find A Grave, online http://www.findagrave.com, Find A Grave, database and images (https://www.findagrave.com : accessed 9 April 2018), memorial page for Hannah Holcomb Hays (28 Aug 1739–23 Jun 1823), Find A Grave Memorial no. 57061947, citing Granby Cemetery, Granby, Hartford County, Connecticut, USA ; Maintained by MacKinnell (contributor 46969222) . McCracken gives the 1834 death date while Bowman gives 1828, both without a reference. Benajah served as a corporal in Capt. Samuel Hayes' Co. and arrived New York City with his brother Ozias, Aug 26, where he was discharged Sept 25, 1776. Became Capt. of 18th Connecticut Militia. [S65] Deanna Holcomb Bowman Thomas Holcomb, Vol. I:Pg. 157/Item 8165. [S25] Hannah McPherson, Holcombe Genealogy, Page 164.2/Item A-8-1-6-5. [S25] Hannah McPherson, Holcombe Genealogy, page 164.2. His marker in the Baptist Cemetary plot #39 shows death 11/2/1826 at age 81. He was a member of the Baptist Church, Revolutionary War soldier. Seaver shows one wife, Anna; McCracken shows another, Martha Benjamin; Bowman shows both with different dates. In the old Baptist Cemetery on Old Granby Road, near the Judah Holcombe House, there is a tombstone that clearly says "In Memory of Anna, Wife of Judah Holcombe who died 11-27-1828." It seems obvious that all of the children were Anna's; don't know where McCracken got Martha. The Granby Town Records first mention Judah Junior at the inaugural Town Meeting, December 1, 1786, where he was chosen the first Town Clerk and last mention him in 1814 when he was still Town Clerk. from Tempest: It must have been an exciting moment in October, 1786, when the Connecticut General Assembly declared that "the Northern Part of the sd Town of Simsbury . . . Shall be and are here by Incorporated into and Constituted a Town by the Name of the Town of Granby & Shall Ever Here after have and injoy all the Rights Privilidges & Immunities That other Towns in this State are Legally Intitled to." Just three years earlier Great Britain had recognized its former Atlantic seaboard colonies as "free and independent states" and now the parishes of Salmon Brook and Turkey Hills seemed to have won an even more important recognition. They were no longer a backwater of Simsbury, but their own community, controlling their own affairs in their own town meeting and electing their own men to run their government. It was in this context that Asahel Holcomb thumped the gavel at the first "town meting of the Inhabitens of Granby Legally Held at the meting House in Salmon Brook Society on the first Monday of December 1786." Their first act was to elect Judah Holcomb Jr. the town clerk, at which time Judah took up the quill and dutifully recorded the subsequent election of his brother-in-law, Captain Samuel Hays as the town's first selectman. [S66] Mark Williams Granby VR, Vol.I:Pg.2. [S65] Deanna Holcomb Bowman Thomas Holcomb, Vol.I:Pg 71, 158. [S64] Mark Williams, A Tempest in a Small Town:The Myth and Reality of Country Life, Granby, Connecticut 1680-1940, Page 16. [S203] J. Hammond Trumbull LL.D., The Memorial History of Hartford County Connecticut 1633-1884, Vol. II:Pg. 229-236. [S25] Hannah McPherson, Holcombe Genealogy, page 149.1, item 8-1-6-7. 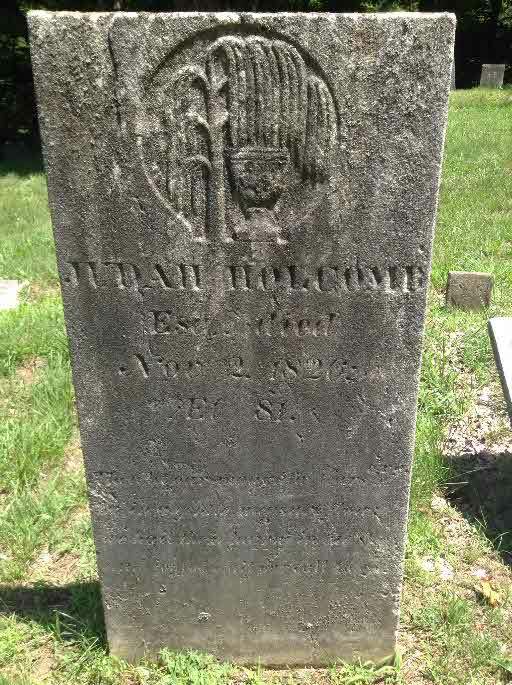 [S807] Find A Grave, online http://www.findagrave.com, Find A Grave, database and images (https://www.findagrave.com : accessed 08 April 2018), memorial page for Judah Holcomb (27 Aug 1746–2 Nov 1826), Find A Grave Memorial no. 55034258, citing Baptist Cemetery, Granby, Hartford County, Connecticut, USA ; Maintained by Sue (contributor 47067682) . His marker in the Baptist cemetery shows death 5/12/1812 at age 62. The 1790 Census in Granby, CT, listed 2 Males over 16, 3 Males under 16, and 5 Females. The 1800 Census in Hartford Co., CT the family consisted of the following: 1 male over 45, 1 male 16-26, 2 males 10-16, 2 males 0-10, 2 females over 45, 3 females 16-26, 1 female 0-10. There is a little confusion here. Dan or Daniel, Hannah Shepherd or Hannah Gillette? There are probably two marriages here, needs more research. [S25] Hannah McPherson, Holcombe Genealogy, Page 149, 183/Item A-8-1-6-8. [S65] Deanna Holcomb Bowman Thomas Holcomb, Vol.I:Pg.158/Item 8168. 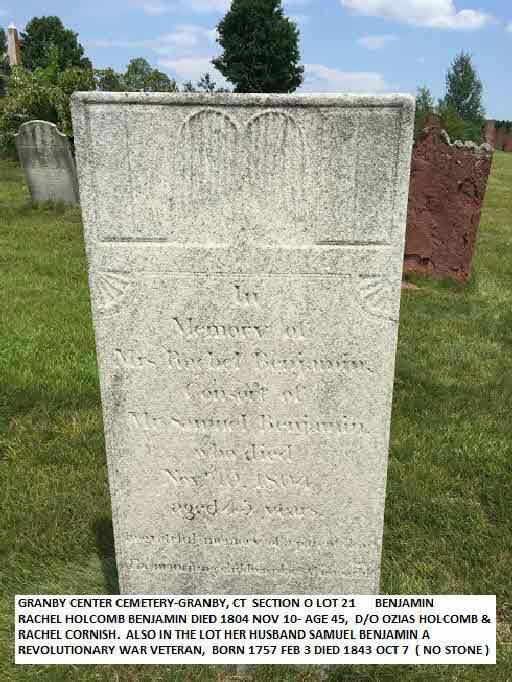 [S807] Find A Grave, online http://www.findagrave.com, Find A Grave, database and images (https://www.findagrave.com : accessed 9 April 2018), memorial page for Daniel Holcomb (21 Oct 1748–2 May 1812), Find A Grave Memorial no. 55034390, citing Baptist Cemetery, Granby, Hartford County, Connecticut, USA ; Maintained by Sue (contributor 47067682) . Penelope and Elijah are listed a members of the First Church in 1785. Carol Laun in later research, May 2016, found that Chatham, CT VR say David Goodrich m. Penelope Holcomb 9 Nov 1772. Son David born 7 Nov 1773 and son Silas born 13 July 1775. Portland, CT church records have David and Penelope Goodrich admitted to membership 24 Oct 1773. David died but I do not have that date. But then Penelope had an illegitimate son named HoraceLAVAN “son of Penelope Goodrich baptized 12 Aug 1781.” Penelope confessed and was restored to the church 17 June 1781 and she married 2nd Elijah Hubbard 28 Oct 1784. He died and she became the 4th wife of James Hillyer (her 3rd marriage). She died in Granby, will proved 15 Jan 1838. Granby Probate Records Volume 7 page 27. Middletown, CT vital records prove that Jeremiah Goodrich and Ruth Kimberly were the parents of both Hezekiah and David. The parents are buried in Portland Burying Ground, Portland, CT. Also, Penelope’s second husband, Elijah Hubbard, adopted her illegitimate son Horace as proved in his probate record. Penelope married James Hillyer 12 Oct 1823 in First Cong Church in Granby. [S65] Deanna Holcomb Bowman Thomas Holcomb, Vol.I:Page 158. [S23] Jesse Seaver, The Holcomb(e) Genealogy, Page 46. [S25] Hannah McPherson, Holcombe Genealogy, Page 186/Item A-8-1-6-9. [S546] Hillyer G. Norment, John Hillyer, Page 129. [S322] Carol Laun, "Penelope Holcombe," e-mail to James H. Holcombe, 9 March 2001. McPherson lists sons Nathaniel III and David as twins, but notes this may be an error in the absence of a birth record of David. There is some indication that David was born after 1701. [S23] Jesse Seaver, The Holcomb(e) Genealogy, Page 41, Item 202. [S25] Hannah McPherson, Holcombe Genealogy, Page 101/Item A-8-1. [S810] Edwin W. Strickland II, William Buell, 1-8, page 34. Capt. 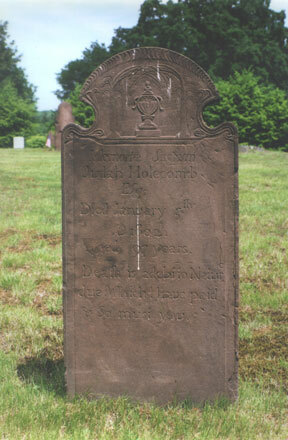 Nathaniel Holcombe was born on 25 October 1696 at Simsbury (now Granby), Hartford Co., CT.7 He was the son of Lt. Nathaniel Holcombe and Martha Buell. Capt. Nathaniel Holcombe was baptized on 5 December 1697 at Simsbury, Hartford Co., CT.7,8 He married Thankful Hayes, daughter of George Hayes and Abigail Dibble, on 9 October 1717 at Simsbury, Hartford Co., CT.9,10,11 Capt. Nathaniel Holcombe married Mary Buttolph, daughter of Sgt. David Buttolph and Mary Buck, on 14 December 1771 at Simsbury, Hartford Co., CT.4,12 Capt. Nathaniel Holcombe died before 18 December 1782 at Salmon Brook Ecclesiastical Society, Simsbury, Hartford Co., CT.
On October 9, 1717, Nathaniel Holcomb III, eldest son of Nathaniel Holcomb Jr. and Martha Buell, married Thankful Hayes, fifth daughter of George Hayes and Abigail Dibble. He was twenty, she was seventeen. The second generation of the Euro-Americans at Salmon Brook was marrying earlier in life than the first had, and this may explain the tendency for the young couples to continue to live a few years in their parents' households before moving on to their own homesteads. It was not until the fall of 1719, a year after the birth of their first child, Hannah, that they had a house of their own next to "Crooked Brook" at the foot of Bushy Hill (now 45 Bushy Hill Road). There in the winter of 1720, Thankful would give birth to Nathaniel IV. The house was placed on the National Register of Historic Places in 1982 and was recognized in 1986 as the oldest house in Granby. Nathaniel and Thankful did not become wealthy, but they did manage to pay off their debts and build a substantial farm. Now in September, 1733, Isaac Dewey of Westfield and Nathaniel Higley purchased the land. They built their new homestead on an 11-acre upland lot just west of their meadow lands, as part of Thankful's inheritance from her father's estate. Nathaniel would clear the stumps of huge trees, begin his orchard, and build a barn for the animals he hoped to raise. Thankful would keep her garden, process and prepare foods, probably with only a few utensils, and share in the care of the animals. Over the next twelve years she would give birth to five more children in the little borning room in the back south corner of the house. In their next house she would have six more, for a total of thirteen. Within a year, they would have a few neighbors - all young people they had grownup with at Salmon Brook. Thankful's brother Samuel had married her friend Elizabeth Willcockson in 1719 and her brother George would marry another friend, Jane Matson, in 1722. Both of these couples received lots just south of the Holcomb's. Farther down the path toward Barn Door Hills her sister Sarah and husband John Gossard would soon build a house, and just to her north, her friend Mary Matson and husband Ebenezer Lamson had a new houselot. After the 1740 marriage of their son Nathaniel to Margaret Gossett, the children of the father and son are confused. For example, both Lydia and Theodosia were born in the same year, as were Roger and Hulda, Ruth and Margaret. Roger can be included with this family because his birth listed his father as Capt. Nathaniel and there was only one Capt. Nathaniel. All other births just listed Nathaniel 3rd or 4th, and the numbers changed when the fathers died. Kathy Fenton notes in her Nutmegger article that the births of the children for Nathaniel and Thankful are not properly recorded because of "the turmoil within the Simsbury church during that period, a time during which either such events were not recorded or the records have been subsequently lost or misplaced. Apparently for some time before the establishment of the second and third church societies in 1736, residents of Salmon Brook (i.e., Granby) had assembled for services at the home of Daniel Hayes (Nathaniel's brother-in-law) . . "
During Kathy's research they located Nathaniel's probate packet at the Connecticut State Library in Hartford. This provided indisputable proof of the names of all children of Nathaniel who survived to adulthood. Some authors have listed two other children that are probably children of other Holcombe families, or grandchildren of Nathaniel and Mary. Zaccheus, who was born in Simsbury, January 14, 1744 or 1745; died July 19, 1762. Seaver does not mention this child. McCracken notes he died at age 17. Bowman and Kathy Fenton both suggest this is the Zaccheus who is the son of Nathaniel IV. Ruth, the second daughter of this name mentioned by Bowman. Hartford County Probate Records of April 1754 show that Nathaniel was appointed guardian of his sister Sarah's three minor children, Ephraim Case 13, Amy Case 10, and Dorothy Case 7. The Nathaniel Holcomb III House on Bushy Hill Road is the earliest remaining domestic dwelling in the town of Granby, Connecticut. When it was erected in 1719, the home was a part of the Salmon Brook Settlement and the Holcombs were the second generation of Euro-Americans from the Holcomb clan of Simsbury, Connecticut. These brave young pioneers had been married in 1717 but lived with their parents until Nathaniel and Thankful Holcomb felt they could strike out on their own. By 1719, a fine timber framed five room house was ready for them to move in and welcome their first child. Their sturdy home was located at the very edge of the wilderness and consideration was given to create, in a sense, a fort to protect them from the sometimes unfriendly native peoples. The home we see here today has been modified in three significant ways since it was built. Evidence shows that the original structure consisted of three rooms on the first level and two bedrooms up. There was also a large attic created by a long sloping roofline that extended from the ridgeline to the first floor wall. This construction was typical for the period and is considered a lean-to or saltbox style design. The cost and availability of window sash in the early 18th century was such that even the “well-to-do” Holcombs had just five small windows located across the front facade of the house. Each first floor room was provided warmth from three fireboxes built into the central chimney mass constructed mostly of huge, cut fieldstones. The largest is the “kitchen” hearth that is an impressive four feet in height with a domed beehive oven in the interior of the firebox, although later a “modern” side oven was added. The interior millwork detail in the formal front parlors was exceptional for the period and included a coat of Prussian blue paint covering which challenges the thought today that the Puritan distained and avoided lively colors. The exterior clapboards were left unpainted during the time the Holcombs resided here. By 1733, just 14 years and five children later, Nathaniel and Thankful purchased a larger piece of land and the home was sold to a wealthy land surveyor named of Nathaniel Higley. Higley lived in the house until his death in 1773. During this period he raised thirteen children and likely converted the saltbox to a fully developed, two story home with walkup attic. The roof was re-framed, the chimney stack was extended and topped off with brick and a brick smoke chamber, used for preserving meat, was constructed against the west side wall in the new attic. It is believed that at this time, the window fenestration was changed from the old fashioned five-light to a more stylish nine-light façade. The clapboards on the front of the house were necessarily replaced and were painted a rich, dark red at this time. Mr. Higley may have also added the present kitchen ell. This one story addition at the rear may have actually been a small, free standing structure added to the northwest side of the big house. His widow Abigail and two of their children lived there until after the Revolution. In 1781, the house was sold to Samuel Hayes Jr. who may have purchased it for one of his grown children. Although Granby town records were lost in a fire, it is clear by 1794, the Reverend Issac Porter was in residence. The Reverend Porter, who monitored the morals of the town with an iron hand and preached on the topic of predestination, was a significant preacher in the Second Great Awakening that swept the country in the 1790s. It seems unlikely, since Porter was not given to material indulgence, that he would have been responsible for any material changes to the house when he sold it to Consider Morgan, a successful surgeon, in 1835. Dr. Morgan was responsible for the last major change to the house: he had the downstairs bedchamber enlarged. What had been a cramped little space accessed by the south end of the kitchen, the old “borning room” was widened and well lit by adding two windows. This became his new office, where patients could enter from the outside through a door discreetly located at the rear. The plastered walls were painted yellow and decorated with stenciled swags, vines and floral motifs. This room addition was covered with a shed roof that extended to the front corner of the house and the balance of the space was used as an open porch accessed also by the coffin door at the southeast corner. In 1851 Dr. Morgan’s heirs sold the property to James C. Bartholomew, a gentleman farmer who helped plan and raise money to establish the park in the town center located around the Civil War Memorial statue. Bartholomew’s daughter, Jane, conducted a finishing school for young ladies in the rear room of the kitchen ell. Provided with its own fireplace, this was a cozy, quiet space removed from the activity of the house proper, enjoying a pastoral view of the fields and the distant hills beyond. Bartholomew sold the property in 1875 to a Mr. John Lewis who, nine years later, sold it to Arthur Rice. Rice went into the tobacco business and built drying sheds on the property, but apparently failed in this scheme because eventually he went bankrupt. In 1902 Lucerne Holcomb may have bought the property on speculation because in just two years he sold it to Michael Kelly, grandson of an Irish immigrant, who ran a successful dairy farm on the property for the next thirty-two years. The estate of Michael Kelly sold the Holcomb house in 1936 to Dr. and Mrs. James Biram of West Hartford, Connecticut. They kept the house until 1969 as a summer residence and made several noteworthy changes during their tenure. Some of the window sash across the front had been changed over the years with what would be described as Victorian style and were deeper and larger than were appropriate to an 18th century house. They restored some of the interior paneling as a result of the window changes and removed most of the Prussian blue paint as was the antiquarian taste of the period. The Birams also retrieved the kitchen hearth from the outdoors and returned it to the proper location. The present owner and her husband purchased the house in 1969 from the widow Biram, who had continued to summer there, and brought to it their love of older houses and commitment to historic preservation. Through careful documentation and architectural research, the new owners Gene and Gemma Baker slowly and with well-reasoned consideration, restored the Nathaniel Holcomb House back to its early elegance and grace. Improvements to deteriorated window sills, replacing a crumbling foundation under Dr. Morgan’s office, the complete restoration of the double front entry doors and surround, the re-discovery of the Prussian blue paint in the best room, the restoration of the “Stimp” stenciling in the former borning room and most notably the repainting of the house in a rich Spanish brown, has returned the house to its magnificent eighteenth-century appearance. The Nathaniel Holcomb III House was placed on the National Register of Historic Places in 1982. [S64] Mark Williams, A Tempest in a Small Town:The Myth and Reality of Country Life, Granby, Connecticut 1680-1940, Page 114-115, 137-140. [S25] Hannah McPherson, Holcombe Genealogy, Page 101.2/Item A-8-1-1. [S45] Albert C. Bates, Simsbury, Page 218. There seems to be some confusion about the Benjamin's of the two Nathaniel's. Nathaniel Sr. has a Benjamin born 2-15-1698 and Nathaniel Jr. has a Benjamin born 2-15-1698. Seaver shows a marriage on 10-12-1727 and McCracken shows no marriage but shows Benjamin's death to be 3 April 1701. Martha died the same day her son Benoni was born. Jonathan had children by 2nd wife Elizabeth Cornish and 3rd wife, Martha Loomis. [S65] Deanna Holcomb Bowman Thomas Holcomb, Vol. I:Pg 27, 70. Jacob Holcombe was born circa 1707.1 He was the son of Lt. Nathaniel Holcombe and Martha Buell. McCracken questions this child noting that he was placed there by The Heritage of Granby page 173. Lt. David Holcombe was born on 25 October 1696 at Simsbury, Hartford Co., CT.2,5 He was the son of Lt. Nathaniel Holcombe and Martha Buell. Lt. David Holcombe was baptized on 30 April 1699 at Simsbury, Hartford Co., CT.2,6 He married Mehitable Buttolph, daughter of Sgt. David Buttolph and Mary Buck, on 1 March 1722 at Simsbury, Hartford Co., CT.7,8 Lt. David Holcombe married Mrs. Elizabeth Hoskins on 21 February 1770 at Simsbury, Hartford Co., CT.2 Lt. David Holcombe died in February 1784 at Simsbury, Hartford Co., CT, at age 87. McCracken notes that no birth found but Seaver has him born in 1695, but his parents were married Nov 1, 1695. McPherson shows David and Nathaniel as twins born Oct 25, 1696. Simsbury Records show Nathaniel as the 1st son born in 1695, so Daniel would have followed him probably in 1699 as Bowman asserts. McCracken, in fact descends himself from this marriage, of Daniel and Mehitabel, one of the five couples in which a Holcombe married a Buttolph. David Holcombe died intestate so there is no will, but the probate record is available and administration bond dated 23 Feb 1784, signed by Josiah Topping and Asahel Hays, who were sons-in-law of the deceased. The personal estate was distributed to the heirs whose names are the same as stated below, except for the omission of Deborah and her twin; both evidently had died. [S65] Deanna Holcomb Bowman Thomas Holcomb, Vol. I:Pg. 70/Item 812. [S25] Hannah McPherson, Holcombe Genealogy, Page 119.2/Item A-8-1-2. 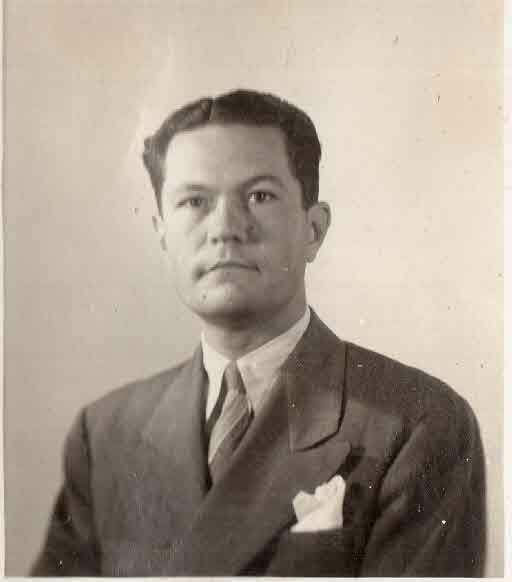 Arthur Craig Kugel was born on 30 April 1919 at Buffalo, Erie Co., NY. He was the son of Leonard Arthur Kugel and Rebecca Bates. 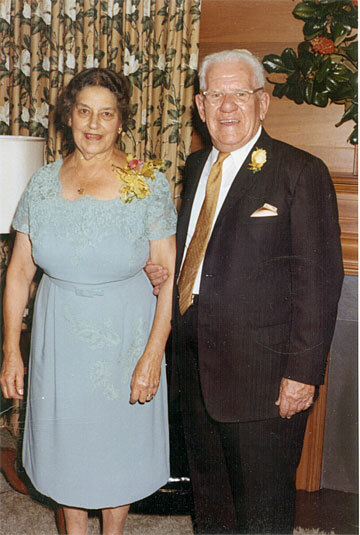 Arthur Craig Kugel married Ida Julie Gianesin, daughter of John B. Gianesin and Emily Long, on 20 July 1940. 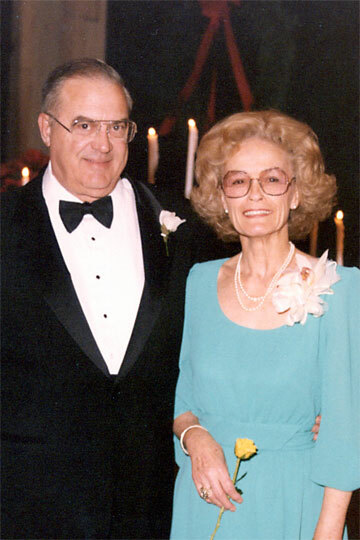 Arthur Craig Kugel died on 24 December 2005 at Cary, Wake Co., NC, at age 86; at his daughter's home. Mary Holcombe was born circa 1710 at Simsbury, Hartford Co., CT; Seaver shows 1710 or 1711, McCracken does not give a birth date but does supply the baptism, McPherson says 1711.3 She was baptized on 27 October 1709 at Simsbury, Hartford Co., CT.4 She was the daughter of Lt. Nathaniel Holcombe and Martha Buell. Mary Holcombe married David Buttolph, son of Sgt. David Buttolph and Mary Buck, on 3 September 1731 at Simsbury, Hartford Co., CT.5 Mary Holcombe was CHURCH MEMBERSHIP on 3 June 1739 at Wintonbury, Hartford Co., CT. She died on 10 October 1810 at Northeast, Dutchess Co., NY. [S25] Hannah McPherson, Holcombe Genealogy, Page 186.1/Item A-8-1-8. [S65] Deanna Holcomb Bowman Thomas Holcomb, Vol. I:Pg. 71/Item 818. 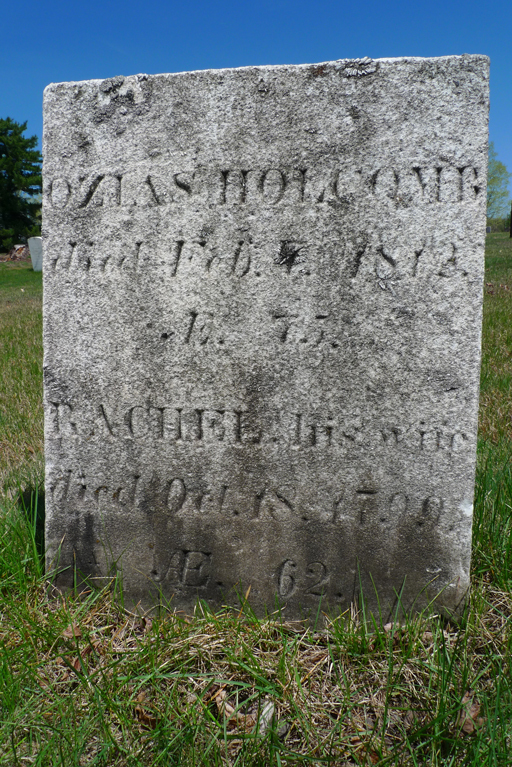 Sarah Holcombe was born on 12 July 1713.4 She was baptized on 12 July 1713 at Simsbury, Hartford Co., CT.5 She was the daughter of Lt. Nathaniel Holcombe and Martha Buell. Sarah Holcombe married Timothy Case, son of Capt. Richard Case and Amy Reed, on 25 September 1730 at Simsbury, Hartford Co., CT.6,7 Sarah Holcombe died on 20 June 1780 at Berkshire Co., MA, at age 66. McPherson gives as the birth date the date the Simsbury VR show as the date of baptism. Seaver suggests that husband may have been Samuel Barber. This family is listed in Simsbury Soldiers page 30. Simsbury records contain the births of all of the following children. Ruth Cost Duncan shows Peter's second wife as Tryphenia Goss, probably a confusion with "Caff" in the old handwriting. [S65] Deanna Holcomb Bowman Thomas Holcomb, Pages 71-2. [S23] Jesse Seaver, The Holcomb(e) Genealogy, Pages 46-7. [S25] Hannah McPherson, Holcombe Genealogy, Page 187.1/Item A-8-1-10. [S104] DAR DAR Lineage book, Vol. XIII:Pg. 9/Item 12026; Vol. LXII:Pg 67/Item 61190; Vol LXXIV:Pg 84/Item 73223; Vol XC:Pg. 158/Item 89488. [S125] Unknown author, "Supplemental Application 73223." [S130] Unknown author, "Application 226965, NSDAR." [S25] Hannah McPherson, Holcombe Genealogy, Pages 101.2, 187.1. See Seaver's correction on his page 243. "Catherine was daughter of 201 Nathaniel (not of 202 Lieut. Nathaniel). 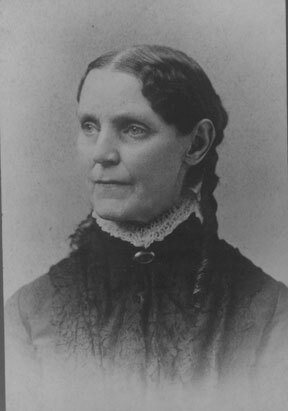 Catherine Holcombe was the daughter of Lt. Nathaniel Holcombe and Martha Buell. [S23] Jesse Seaver, The Holcomb(e) Genealogy, Page 41/Items 201.8 and 202.11.